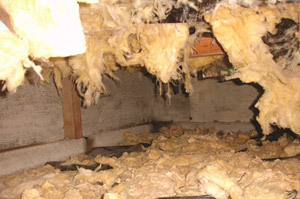 Does your crawl space have fiberglass insulation that is wet and sagging? Has some of your crawl space insulation fallen onto the floor, like the insulation shown in the photo? Wet, sagging insulation is a serious problem. In addition to creating a soggy mess, this wet material creates conditions that are ideal for mold colonies to form on your home’s wood framing and elsewhere in the crawl space. Mold can lead to wood rot and also threaten your health with a wide range of allergic reactions and respiratory issues. Basement Systems, Inc. is the industry-leader in dealing with below-grade problems, including a wet basement or damp crawlspace. Schedule a free estimate today to replace your wet crawl space insulation with an insulation material that will help you achieve a dry, healthy crawlspace. Why won’t fiberglass insulation work in a crawl space? SilverGlo™ can be cut to fit between floor joists against rim joists. 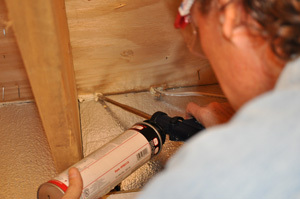 Foam sealant may then be used to eliminate air leaks. In the past, many builders installed fiberglass batt insulation between the joists in crawl spaces and built crawl spaces that were vented to the outside. This common practice proved to be extremely damaging to homes with crawl space foundations. The moist outside air that enters the crawl space condenses on cooler surfaces like joists and sheathing all throughout the structure. In turn, this steady supply of water droplets is absorbed by fluffy fiberglass insulation. Heavy with water weight, the insulation compresses, clumps and falls out from between the joists –ending up on the crawl space floor. Instead of helping the house be more comfortable and energy efficient, fiberglass insulation is creating problems. SilverGlo™ rigid board insulation stops heat loss three ways: It stops air movement, reflects radiant energy, and resists conductive losses. Today, building scientists -- the engineers who study home performance -- recommend that crawl spaces be encapsulated or sealed and then be insulated with rigid foam board insulation instead of fiberglass. While there are many types from which to choose, Basement Systems recommends SilverGlo™ rigid board insulation. An expanded polystyrene foam insulation, it can be securely fastened to exterior foundation walls and fitted against rim joists. It is clean, durable, seals against both air and moisture infiltration, and effectively resists conductive and radiant heat losses. Graphite particles impregnated throughout the foam board boost SilverGlo™’s ability to stop radiant loss compared to conventional expanded polystyrene insulation. SilverGlo™ panels also include a radiant heat barrier on the visible side. Radiant barriers help prevent heat loss by radiation and facilitate to use of strong reflective tapes to seal seams against air movement. This type of insulation is ideal for use in crawl spaces and basements because it won’t be damaged by water, lose R-value, compress or fall out of place. By sealing and properly insulating the crawl space, this under-house area remains clean, dry and energy efficient. When it comes to adding crawl space insulation, not all materials are created equal. It takes a special type of product to effectively insulate the crawl space while withstanding even the dampest, wettest conditions. SilverGlo™ rigid foam insulation has the ability to do just that! Call us at 1-800-638-7048 or get an online quote to have crawl space insulation installed by your local Basement Systems, Inc. dealer today!